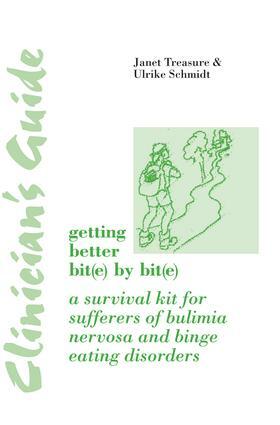 The publication four years ago of Getting Better Bit(e) by Bit(e), written by two eating disorder specialists at London's world-famous Maudsley Hospital, was a milestone in the treatment of bulimia. For the first time a self-help book was shown, by rigorous clinical trials, to cure a significant fraction of women suffering from bulimia, and to reduce the therapist contact time needed by others. Getting Better Bit(e) by Bit(e) offered an efficient way of treating bulimic patients, which would be valued by any resource-conscious health service. The authors of Getting Better Bit(e) by Bit(e) have now written this Clinician's Guide, to help health care professionals maximize the benefit that patients obtain from the self-help book. Based on the authors' wide-ranging experience of treating eating disorder patients, it provides a step-by-step account of how the chapters in Getting Better Bit(e) by Bit(e) can be used to ameliorate various aspects of bulimics' difficulties, with examples drawn from real patients' case histories. Particular emphasis is given to the problem of motivating patients who are reluctant to change their behaviour, using Miller and Rollnick's motivational interviewing approach. The Clinician's Guide to Getting Better Bit(e) by Bit(e) will be invaluable for all those treating sufferers of bulimia. Vomiting, Laxatives, and Diuretics: Have Your Cake and Eat it—Or Not? Relapse: Walking In Circles—Or Not? Is this the End of the Journey—Or Not?